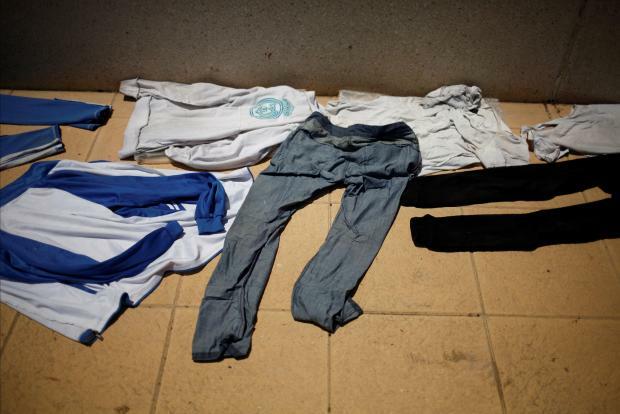 Clothes of migrants are seen laid out to dry outside an overcrowded sport center after arriving on a rescue boat at the port of Tarifa. It's time to face the truth. Migration cannot be stopped and will not be stopped. It is history which teaches me that, not my humanitarian values. We can build the biggest walls, we can send soldiers to patrol the borders and we can set up reception centres in the desert. The truth is people in desperate situations will reach out for the highest ladders to scale those walls. Desperate people are prepared to face soldiers’ rubber bullets, and they will take the most dangerous routes possible to circumvent the desert reception centres. As Malta finally accepts to dock a ship packed with 234 migrants stranded at sea for six days, amid squabbling between leaders seeking to defend their patch, here are some points to ponder. Stop blaming everything on Brussels. EU national governments today stand on a platform of national egoism and selfish interests. The European Commission has been desperately trying to patch up a workable programme to help countries from where migrants are fleeing. But once at the negotiating table, EU leaders have merely sought their own political interests even at the expense of migrants dying at their borders. Just look at Germany as an example. Angela Merkel almost single-handedly saved thousands of desperate refugees from certain death in 2015. Fast forward three years later and she's being held hostage by an Interior Minister who threatens to bring down the German government if Merkel accepts a dozen migrants stranded in the Mediterranean sea. Cue: right-wingers of neighbouring EU states adopt the same policy. There is no migration 'crisis'. Figures of people fleeing and reaching Europe are actually down as we thankfully see the back of the worst of the Syria crisis and the stabilisation of certain African countries. The boat arrivals in Italy are down by 70 per cent this year compared to 2017 – and yet when you listen to Matteo Salvini you'd think there's an invasion of biblical proportions. That's because his right-wing party is bent on exploiting people's fears to score domestic points. And the man even has no shame in cracking jokes to flex his racist policies (see tweet below). Not in my back yard. Clearly, a lot of the Eastern European states can only deal with the issue by rebuilding the walls they fought for so long to demolish during the Iron Curtain era. It's about time the EU stops ignoring the human rights breaches perpetuated by the likes of Hungary for merely populist means. Yes, that means the EU should actually start contemplating whether the likes of the despicable Viktor Orban should have the privilege of being in the EU bloc, which prides itself on free movement of people and human rights. NGOs are not the enemy. They are plugging a hole in the middle of the desperate sea of political wrangling. When NGOs say migrants should not be taken back to Libya they are merely abiding by international law not to return people to dangerous places... a fact very conveniently overlooked by governments. If it pleases you to call them a water taxi for migrants - then fine - but without them we are increasingly facing at a funeral cortege of sunken dinghies. The media needs to take a good look at itself. And that includes us media houses in Malta. The longer we keep fuelling stereotypes, the more we're going to feed into people's fears, and that means the more these same people will demand the most despicable policies from governments. There's a reason why the likes of Donald Trump is on an obscene mission to stamp out the mainstream media. He simply doesn't want a watchdog to call out his human rights breaches. We simply cannot allow politicians to feed us the usual cliche of “national interest” at the expense of human rights and dignity. There is no one solution. Migration problems will never be totally resolved but they can be cushioned. Each EU state needs to set up comprehensive integration policies to protect the vulnerable, enhance legal channels for economic migration when needed and really kick-start pilot projects in key third countries. They simply cannot continue taking an ad hoc approach, acting with only short-term deadlines in mind. And the sooner each one of us arms ourselves with the facts, the sooner we can stand up to the fascist threat enveloping Europe. History should teach us something.